As I said in the introductory post, an accelerator programme provides a mixture of office space, seed funding for a business, mentoring, seminars, and a network of contacts. In this post I want to summarise what we got in the way of all these things and what we gave back in return. 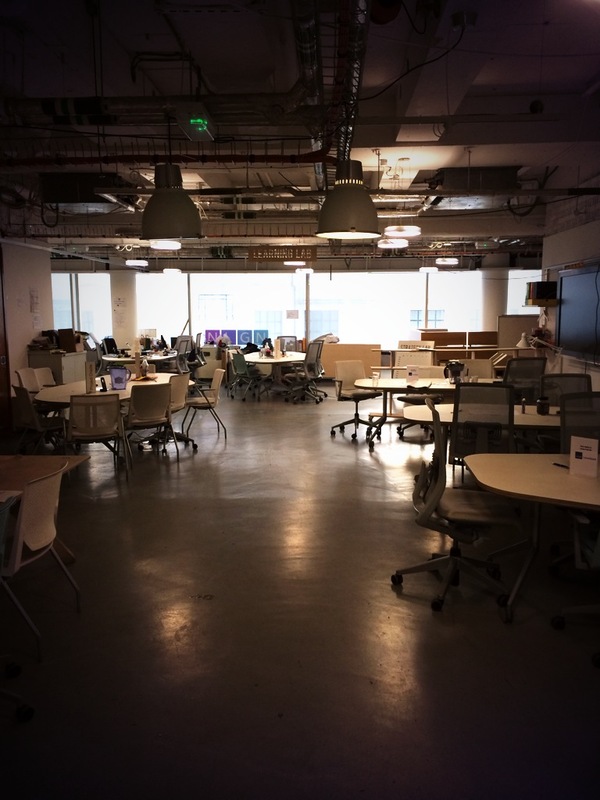 We were based at Hub Westminster , a co-working space just off Trafalgar Square on the first floor of New Zealand House. I love New Zealand and it was great to see the touristy promo pictures everywhere on the way in. Also, the space itself is very shiny. The desks we occupied were on the right-hand side of the picture. If you’ve never been to the Hub, there are a couple of seminar spaces (dubbed the “Strategy Lab” and “Stage” respectively) which is where all our presentations happened. The first week was entirely organised for us, but after that we got into a routine: Tuesdays (all day) and Thursday mornings were mostly filled with relevant seminars, we had Wednesday mornings and Thursday afternoons free to pursue our ideas, and we did a pitch every Wednesday afternoon in front of a small group of peers and mentors. We were both working in our day jobs on Mondays and Fridays for the 14-week duration of the programme (and occasionally handling issues back at the mothership whilst in sessions, but this was kept to an absolute minimum) and I traveled up on Monday evenings and back late Thursday afternoons. Lucy had regular digs, but I stayed in a variety of AirBnB places to see a bit of London, meet some new people and keep costs down. Each team founder received £9600 in seed funding (in the form of a loan) and this was released in 3 tranches – after 6 weeks, 12 weeks and the rest at the end. In order to receive this funding each team had to set up a company. The programme was funded by Cabinet Office and Capita. Even though we were still employed by the Council for the duration of the programme, we opted to take the seed funding as, amongst other reasons, we were conscious we were taking a chance on the programme and we didn’t want the council budget to be affected. There’s an entire blog post on this topic coming up later. I literally lost count of the interesting and knowledgable people the crew wheeled out for us on a regular basis to help us improve on our idea. Mentors came from public, private and third sectors and some listened to and fed back on our weekly pitches whereas others gave us an hour here or there to help us firm up particular aspects of our idea. In addition to this the teams were paired up to provide peer mentoring to each other, to encourage more open working between the teams. I was given to understand this was unusual for an accelerator but maybe someone out there can comment on that. We had regular seminars on every topic relevant to starting a new venture you could ever wish for. The first week had a lot of orientation stuff in it but included a day of introducing teams to the Lean Startup methodology. We made pretty well all of these sessions except for one or two where we had clashes with other meetings or travel arrangements got the better of us. There were 15 teams on the programme ranging between 1 and 4 people in size. 4 of these (including us) came from local government and one was based in a local charity with the others being a range of straight commercial and social enterprises. These are just labels, though, as even the commercial teams were very social-purpose driven. Each Wednesday all the teams had dinner together and between us and the crew we managed to rope in an after-dinner speaker. Apart from my prodigiously talented co-founder Lucy Knight producing sketchnotes of most of the sessions and of the after-dinner speakers too (they are all here on one of our Pinterest pages) we, like all of the groups, were encouraged to provide ad-hoc mentoring and feedback on the other teams’ pitches on Wednesday afternoons. As one of the few Local Government teams we felt a certain responsibility to ensure that the programme as a whole actually delivered results for our sector and our knowledge about what life is really like inside local councils was certainly sought after by some of the other teams, especially those with ventures that might end up selling into local government. In summary, we crammed a lot into the 14 weeks of the programme. All fantastic, amazing, shiny stuff. So how did we use all that (and where did we find the time) to turn our idea from concept to reality? « PS LaunchPad 1: What on earth…?